This site is also still under construction. If you are planning to visit the Ideal Home Show 2018, we have teamed up with MK Kids Interiors to give away Ideal Home Show tickets. Join their mailing list to win Ideal Home show tickets. And we hope to see you there. We will be hosting Free 30 minute design consultations, so if you have any projects to discuss, please book and come along with photos of your spaces. Do you work from home and need a work space? Our garden studio, otherwise known as ‘The Nest’ is almost complete. Working within a budget we built a 2.5 x 4m room that is detached from the house a the back of the garden. We used recycled insulation, a second hand window and a door, which really helped with keeping the costs low. We sourced everything locally in Hackney and Haringey. We worked with amazing trades, such as Mixamate, DW General Woods, Mems and Leylands. As a woman dealing with these companies, it was an absolute pleasure. When a woman shows up to a timber yard, she isn’t usually taken seriously, but these guys were amazing! We laid a foundation, and built this garden room from the ground up. Living among the greenery of the garden, we wanted it to have a natural look and feel – slightly rustic; to blend in with its’ surroundings but also modern. The roof is raise at an angle, and finished in a dark grey, weathershield dulux paint to create a contemporary aesthetic. To clad the exterior, we used three different colours of stain and wood protector. Each piece was carefully cut and applied to the shell of the building to create this stunning finish. The contrast between the stain of the wood and surrounding trees are absolutely beautiful. The garden room is complete with sockets and lights; therefore can be used all year round, day or night. To build a garden studio like this with materials and labour you will be looking at spending between £7,000 – £10,000 and can be completed within 4 weeks. Although we made huge savings on the window, door and insulation, these items can cause the cost of building to increase, when purchased new. We are currently taking orders in to build more garden rooms in 2018 for those who work from home, or if you would simply like an alternative space to entertain your guests. At Nesting Properties – we don’t do cheap, we aim for quality! Ottomans and storage tables function as extra space, and can be filled to the brim with goodies such as DVDs, books, and anything else you want to hide but also have quick access to. If you have a small family, but want to be able to have guests for dinner, a dining set with an extendable table is ideal. The Ingatorp Extendable Dining Table by IKEA in black or white can seat 6 people when adjusted. Matching chairs are available. Instead of using table or floor lamps which can take up much needed space, try wall lights to bring soft illumination. Mirrors are also a great way to add light to your living room. Find some quirky shelving to house decorative items. These innovative Hexagon Mirror Shelves from Not On The High Street are classy, practical, and double up as mirrors. Low-level sofas and armchairs give an illusion of more space and higher ceilings. They’re also unusual and will make your guests feel cosy. Try a corner sofa for extra comfort points. Rather than spacing out family photos across a wall, group them together in a collage multi aperture frame, or opt for a photo album, like this French Style Wooden Photo Box from Amazon. Don’t be afraid to use it. Especially if you have paler walls, try using pattern on the floor, in the form of staircase carpet, a runner, or floor tiles. Again, consider your chosen colour scheme, and decide to go with an unusual or conservative pattern like the Mr Jones floor tiles by Laura Ashley in Dove Grey. If your hallway is a little on the dark side, here are some solutions. Glam up an understated hallway with a chandelier, or something similar. There are so many creative takes on the classic chandelier to suit every taste. Built-in LED stair lights are a stunning way of lighting the way in the day, or, more fabulously, at night. For a more vintage feel, try wall sconces. If you’re fortunate enough to have a large hallway, create interest and consider utilising the space by adding a dressing table, seating/shoe storage, coat rack, umbrella holder, or mirror. Place some family photos on the walls to greet guests when they enter. The honeycomb ‘Honefoss’ mirror is by IKEA, and the hexagons can be hung any which way to suit your space. Nesting Properties would be glad to transform your hallway to suit your every need. On 26th March 2017, our founder was invited to be one of the keynote speakers at the Ideal Home Show. The interior styling stage audience were ready and waiting with note books and pens to hear what Medina had to say. Designing your Dream Kitchen was the title of the talk. The talk was practical and the audience were engaged. When re-designing or designing your kitchen. 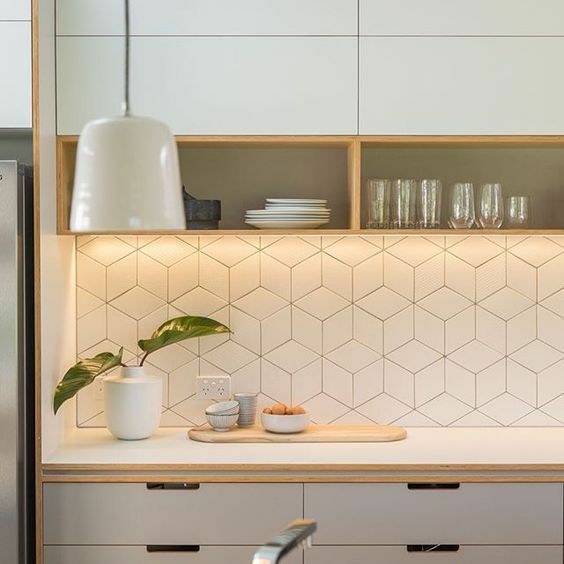 It is important to consider the ‘kitchen work triangle’ which is the concept used to determine the most efficient use of the space. The basis tasks in the kitchen takes place between the hob/oven, the sink and bin and the refrigerator. 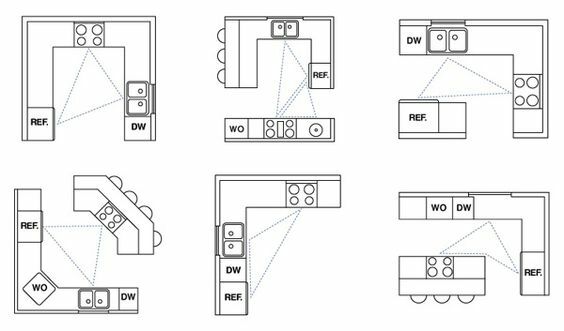 This image below shows the various kitchen layouts and how to achieve the ideal work triangle. It is also important to think about your lifestyle and what effect it has on you using your kitchen. Do you mostly dine out? If so, you wont need too much storage for foods. 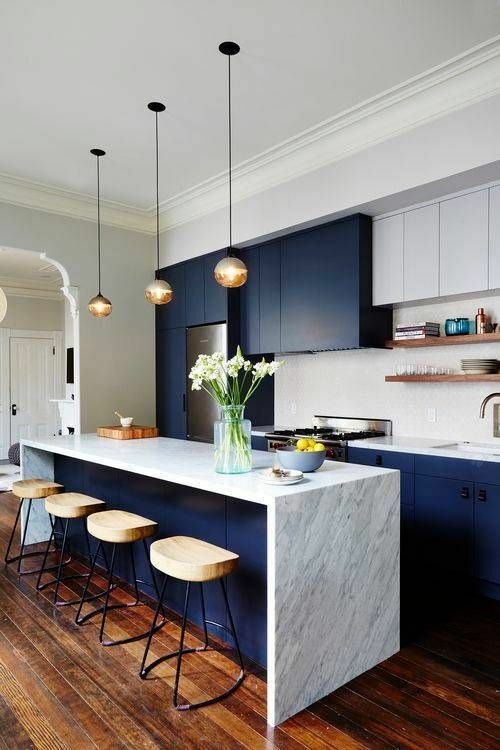 You can therefore afford to create a minimal kitchen. Are you a stay at home parent? Do you cook everyday? You will need freezer storage, fridge storage and ample cupboard storage. Medina ended the talk giving the audience 9 top tips for designing your kitchen on a budget. 1. Spring clean & Organise your space – Many home cupboards are filled with old foods and containers that are no longer in use. Throw out the old to make space for the new. As we are in Spring this is the best time to throw out and de-clutter. If you need any help de-cluttering, contact Sally, she is great! 2. Start planning- budget,colours, layout, tiles, worktops, appliances – Its pretty easy to over spend on your dream kitchen. It is therefore essential to plan, and allocate a budget for your kitchen. Think about what you need instead of what you want. Focus on the needs before spending on the wants. 3. Conti Board vs Plinths – Decorative panels are cheaper than installing a plinth as a kickboard. Although the colour options are not wide, with Pinterest, you can get many ideas on how to jazz up your kickboard. 4. Get handles from Ikea rather than B&Q – Don’t you just love Ikea! They have a wide range of handles that can be used on your kitchen cupboards. 5. Get tiles from Tile shops (for their returns) – although tile shops can be expensive. You will be surprised to find that you can bag a bargain from the tiles that have been returned. 6. For mouldings and architraves go to a timber yard – firstly the quality of the timber or even MDF from the timber yard is better than B&Q. Mouldings and architraves are cheaper in a timer yard than on the high street. 7. Taps are cheaper online – You can find your dream tap online, they are cheaper there, than on the high road. 8. Strip out yourself – After capping the gas and water supply and disconnecting the electricals, you can remove the units yourself. That will save you £220. 9. Ready Built Kitchens – sometimes you can get kitchen units that are already assembled from companies such as Selco. All you will need to do is put the units in place – and of course, get a plumber and electrician in for the utilities. 10. Why settle for the get by – when in the long run the good costs less, Invest in quality materials and appliances, so that you wont need to buy in the next 5 years. You can see a few clips of the live video on our Facebook Page. We are always happy to help, give us a call 020 3287 3722.